queenolive | the behind the scenes action and drama in a Chefs life ! “Clap along if you feel like a room without a roof , because Im happy … clap along if you feel happiness is the truth ..because im hap…” SNOOZE ! With swollen eyelids and a heavy head , I tap my feet . “Happy” by Pharell Williams never fails to pep me up . 8:00 am already … I run around , get ready , grab my coffee , read the newspaper and rush to work . By the time I reach work , Im feeling energetic and raring to go , thanks to the ipod and my music ! As I step into my domain, the kitchen , I am surrounded by my staff wishing me a “good morning” , and yet telling me things that portray how this morning is anything but “good”. And, this is an everyday routine. “Chef , the vegetable supply has not come, now we cant be ready for lunch service” , “Chef the deep got spoilt last night so its impossible to get new meats” ; “Chef the oven isnt heating properly so we cant bake our breads today.” My day usually starts with one of the “problems” , which are all easy to solve or deal with, but the biggest problem to deal with is the negative approach that people begin their day with. My boss and mentor, Chef Sabyasachi Gorai,always keeps telling me and my colleagues that “I never want to listen to a NO . If there’s a problem tell it to me but give me a solution to the problem. No matter how stupid the solution is , give me a solution. Dont expect me to give you solutions when you are not thinking yourself.” For the last 3 years that I have been working with Chef Saby, I have seen him saying this line to at least one person every single day. Soon all of us became so scared of using negative words like No, Cannot, Impossible , in front of him , and to avoid his temper we would think of solutions to a problem, no matter how stupid the solution be , just so he doesn’t think that we haven’t used our brains. Slowly, without realizing it, I subconsciously started thinking of a solution as soon as a faced a problem, whether it was a professional problem or a personal problem. From problems such as not having ham in my fridge while making eggs bennedict and deciding to serve it on masala jeera aloo, and realizing that its an absolutely delicious combination , to making a cake ring out of carboard and wrapping it in foil , to fixing a broken friendship by refusing to say “no” and giving up. By changing my “no” into a “yes” , I without realizing , found solutions to most of the challenges that life threw at me. And maybe the solution to most of lifes dilemmas is a simple change in our outlook. Once in a while people are lucky enough to see a genius at work, right in front of their eyes . Luckily for me, I don’t only get to see a genius at work , but I get a chance to work under his guidance, contribute , albeit in a small way , to his vision. The “genius” that I am referring to here is Chef Sabyasachi Gorai, popularly known as Chef Saby. Despite the fact that he has more than 20 years on experience in the food industry, he is also an artist, actually a food artist, who in his own words – “Treats the plate like his canvas and the ingredients as his colors”. I had procrastinated writing a blog for the longest time, but I just couldn’t avoid picking up the pen and writing down today’s or rather my last week’s experience. About 20 days ago Chef Saby called me and said that there is a food art installation tht he is supposed to make for an event scheduled on the 1st of October at Leela Chanakyapuri. 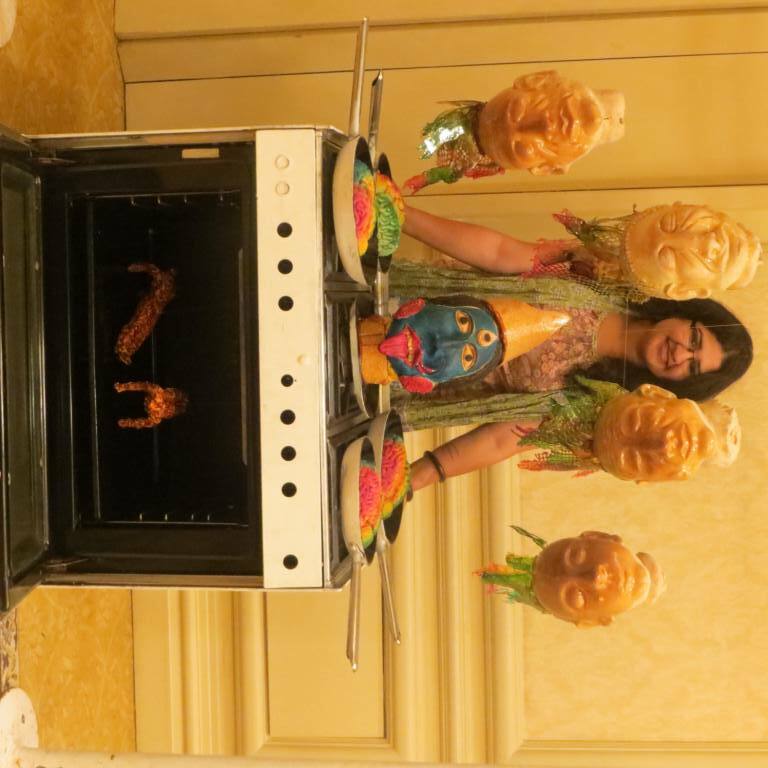 The event was the 3rd edition of the CSSG (creative servive and support groups) summit 2013, wherein some of the biggest names from the food industry had been invited to put up art installations made entirely out of food. “Okay” , I thought to myself. I don’t have any idea about art and I have never even heard of a food installation, so how in the world am I going to give my ‘thoughts’ and ‘ideas’! My boss is going to think I’m a complete idiot! As a child, he grew up in a small town, called Asansol on the Bihar-West Bengal border. It was a very small, deserted, coal miner’s town, where one found no recreational fun activities to do. Slightly further down from the house where he lived there was this pond, where buffalos would take a bath and for the children it was their swimming pool where they had fun. Interestingly, the pond was actually made for a cremation ground or shamshaan. It was one of that old day’s Shamshaan, which was named after a Kali temple next door. As you know, most shamshaans in West Bengal, have depiction of the Goddess Kali. As Kali is the Goddess of death, Kali temples are always attached to shamshaans. This particular Kali was called ‘Chinnamasta’ which means ‘Kali without the head’ and hence the name of the shamshaan near his house was called “Chinnamasta” Shamshaan”. He used to go to that area for a walk or a dip in the pond and look at this particular idol of Kali, where the heads are hanging in the air and Kali is drinking her own blood from her own head which is splattering blood. This image stuck on in his memories and meandered in his thoughts ever since. Brain drain is the departure of large-scale emigration of educated or professional people from 3rd world and developing countries to first world countries usually for better pay or living conditions and also other lucrative prospects. Chef too went to Australia to work in his early twenties for a better life and future. As a young mind who wanted to explore & see the extensive world of food beyond India .He left his country to learn new nuances of the trade and also to experience the better world as they say. However he was one of the few people who decided to come back as he felt that he had a better future in India as a Chef, and also because the thought of doing something in his own country meant much more to him than doing something in a foreign land! He uses this global phenomenon to be depicted in this installation where the upside down head dripping brain depicts the brain been drained and hence the context of this global phenomenon “Brain drain”! Moving on from childhood memories and the global phenomenon, he also relates this art piece to a very important menu that he is currently working on – an Iranian menu, which has a famous dish called the “Bheja fry” which is extremely popular across India. So as he explained the assembly of the installation, I realized that this will not be a run of the mill kind of installation that we see of food these days. It is of a different genre where life influences meet the thought process to create this piece. 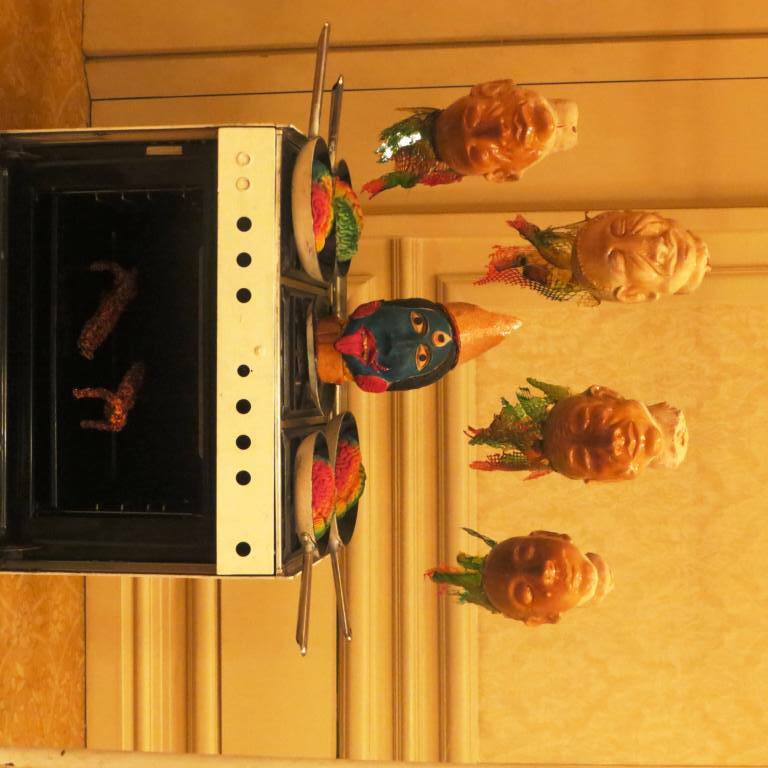 The assembly is as follows, there will be 4 upside down human heads made out of bread dough with sugar work on them, plus the heads will have the brain falling out of them into 4 pans on a gas burner. 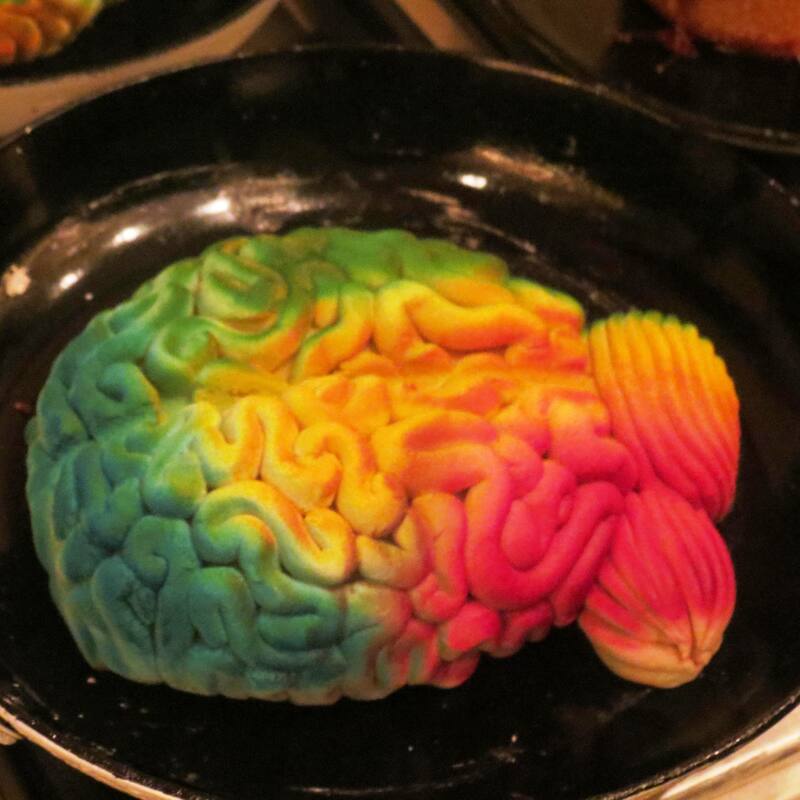 The brain will be made out of salt dough and will be colored using food colors. The human heads will be colorless, since they are dead people. But the highlight of the installation will be the head of the Chinnamasta (Kali ma), which will be fully coloured and will be straight not upside down. The cooking stove has an under counter oven, there will be figures made of white chocolate and red chilly flakes. Chilly flakes because the oven is hot and the chilly is symbolizing the heat of the oven. The idea sounded so fabulous that all of us just couldn’t wait to start putting it to life, or rather death! We started by assisting Chef in making the heads with the bread dough. The heads had to be shaped , structured and molded by hand. So all of us felt like potters working on a sculpture with clay. Once the face was structured, we had to dry it in the oven so that it would become firm and hard, and wouldn’t break once it was hanging upside down on the final day. For the face structure, Chef took inspiration from a few peoples faces in the kitchen. 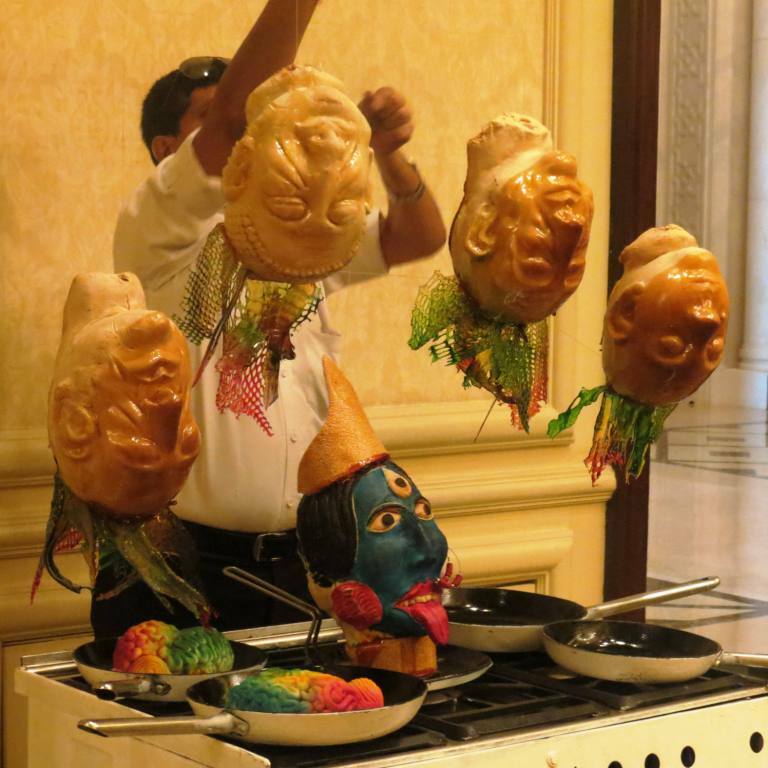 One of the face was inspired by a bakery chefs face, Kali ma’s face was inspired by a sous chefs face, and one of the faces ended up looking like a Russia man’s face because it was structured by one of the students of Olive culinary academy, who is from Minsk! So basically we had a wide variety of face structures in terms of regions and countries! Once all the faces were baked we decided to test them by hanging the exact way that they would be hanging at site .What we didn’t realize that each face was 4 kgs and we would have to make sure that it was baked properly . But as luck would have it , the moment we hung one of them it fell and the entire face had to be restructured all over again!!! Sigh! The sheer agony!!! Finally we were done with the faces and the brains and the only thing left was to colour the brains and paint and decorate the Chinnamasta. Late in the evening myself and a sturdy, male colleague with a big built ran to the Mehrauli market to pick up jewelry for the Chinnamasta. Once we were back and had the jewelry approved by Chef, were the faces complete. In the morning the final touches of sugar work, sesame brittle and food colour were completed and we proceeded to the Leela Chanakyapuri , where we set up and assembled the installation. The best feeling was the look on everyones face when we completed setting up the installation, people were shocked, amazed, amused , bewildered all at the same time ! The installation will be unveiled at 8:30 pm today (1st October ) , at the event, now only Chef Saby will be able to tell us the proper reaction of everyone there . Fingers crossed ! !